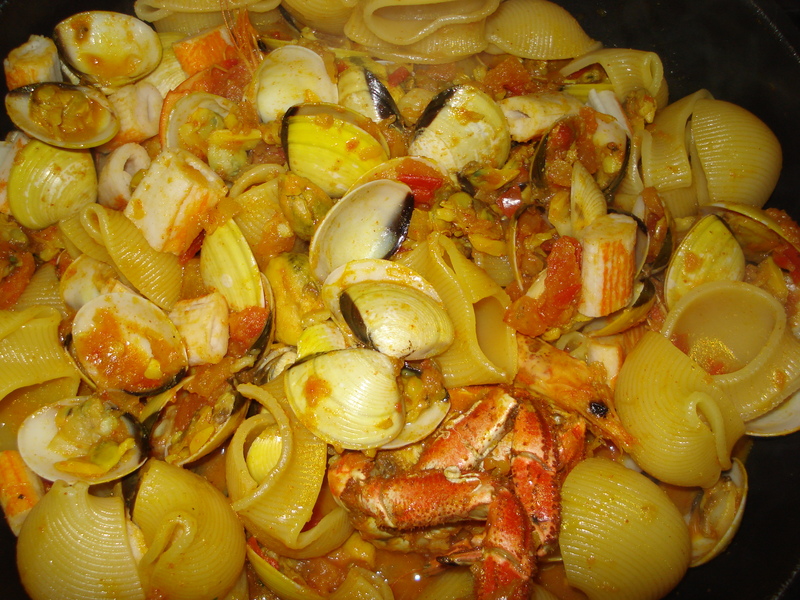 ‘Massada de Marisco’ is a popular Portuguese style seafood pasta dish. It is a delicious seafood medley combining shrimp, mussels, clams and lobster along with typical Portuguese flavors like piri-piri and white wine. This makes for a great seafood pasta dish with intense flavors that is sure to impress. 1) Clean and wash the clams and mussels by placing them in a bowl of waters for 1-2 hours. 2) In large pan, bring to boil the onion, garlic, pepper and olive oil. 4) Let it cook for 1-2 minutes, add the tomatoes, piri piri, and white wine. 5) Let it simmer for about 5 minutes and season with the salt and pepper to taste. 6) Add the mussels and the 6 cups water and bring it to a boil for about 2 minutes. 7) Add the pasta and let it simmer for about 5 minutes. 8) Add the lobster and shrimp with all the pieces intact. 9) Finally, add the washed clams, and let it simmer on medium heat for 10 minutes. 10) Once the pasta is well cooked and the seafood is done, remove from the heat. 11) Pour into a large serving bowl and top with the chopped cilantro. Serve.